EXECUTIVE ACCESS: WaterSound guests staying at this property have complimentary access to the WaterSound Beach Club, which includes 3 community pools (including the 7,000 square ft zero-entry pool at the WaterSound Beach Club), 2 lazy rivers and complimentary beach chair service on a first come first serve basis as well as the use of two kayaks or canoes for one hour per day, 20% off stand up paddle boards at the WaterColor Boathouse and, for an additional cost, full access to Shark's Tooth and Camp Creek Golf Courses, the WaterSound Fitness center, and 2 tennis courts at both Shark's Tooth Club and the WaterSound Beach Club. DETAILS: Experience the ultimate coastal escape when you plan your stay at this tranquil “Seaglass” home. 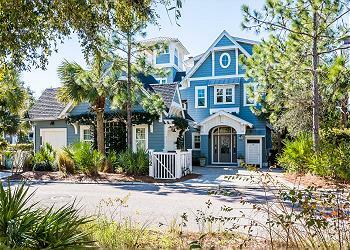 152 Yacht Pond Lane is a luxurious WaterSound property offering 5 bedrooms, 5.5 bathrooms, and stunning accommodations for 12 guests. Exposed wood beams, stunning hardwood floors, and shiplap walls warmly welcome guests to this home. An expansive and open-concept floorplan ensures guests can spend ample time together in the main living space. The family room boasts two lush sofas, cozy armchairs, a flat-screen television, and a beautiful shell-inlay fireplace façade. The wet bar, conveniently located close to the kitchen and living areas, boasts granite countertops, a wine cooler, and all the bar + glassware you need to concoct the perfect beach cocktail. The gourmet kitchen is a cook’s delight and features beautiful granite countertops, top-of-the-line stainless steel appliances, a walk-in pantry, and plenty of counter and cabinet space. The nearby dining table offers seating for 10 guests, with 4 additional seats available at the adjacent breakfast bar. Guests can choose from two beautiful guest rooms on the second floor, each offering a plush queen bed, a private bathroom with a glass-front shower, and a private balcony. The gorgeous master suite boasts a king bed and a private bathroom with a shower and a soaking tub. Guests in this room will enjoy the sitting area which features a sofa and a flat-screen television, and the suite offers a private balcony as well. The home’s second master suite is on the third floor and offers a beautiful king bed, a private en suite bathroom with a shower and a soaking tub, and a large balcony. Kids will love the bunk room, which features two twin-over-twin bunk beds, a flat-screen television, and a shared bathroom with a shower/tub combo. Also on this floor is a secondary living room offering a cozy queen sleeper sofa, a large flat-screen television, and a pool table. A spiral staircase leads to the home’s lookout tower, which boasts incredible WaterSound beach and community views. 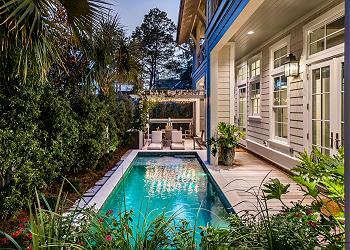 Guests will love the home’s private, sparkling pool, which can be heated for an extra fee from October to May. The outdoor oasis also features a wood-burning fireplace, perfect for enjoying chilly nights after sunset. This incredible home is located just 200 yards from the sugar white sand beach and sparkling emerald waters. Enjoy the many world-class dining and shopping options throughout our beautiful 30A seaside towns. Love this house! Would stay here again and again! Very clean and very well maintained!